For the band, see Silage (band). Not to be confused with Sillage. Silage is fermented, high-moisture stored fodder which can be fed to cattle, sheep and other such ruminants (cud-chewing animals) or used as a biofuel feedstock for anaerobic digesters. It is fermented and stored in a process called ensilage, ensiling or silaging, and is usually made from grass crops, including maize, sorghum or other cereals, using the entire green plant (not just the grain). Silage can be made from many field crops, and special terms may be used depending on type: oatlage for oats, haylage for alfalfa; but see below for the different British use of the term haylage. Silage is made by one or more of the following methods: placing cut green vegetation in a silo or pit; piling the vegetation in a large heap and compressing it down so as to purge as much oxygen as possible, then covering it with a plastic sheet; or by wrapping large round bales tightly in plastic film. Partially dried mown grass is formed into cylindrical bales in the field (above) and sealed in polywrap (below). The crops most often used for ensilage are the ordinary grasses, clovers, alfalfa, vetches, oats, rye and maize. Many crops have ensilaging potential, including potatoes and various weeds, notably spurrey such as Spergula arvensis. Silage must be made from plant material with a suitable moisture content: about 50% to 60% depending on the means of storage, the degree of compression, and the amount of water that will be lost in storage, but not exceeding 75%. Weather during harvest need not be as fair and dry as when harvesting for drying. For corn, harvest begins when the whole-plant moisture is at a suitable level, ideally a few days before it is ripe. For pasture-type crops, the grass is mowed and allowed to wilt for a day or so until the moisture content drops to a suitable level. Ideally the crop is mowed when in full flower, and deposited in the silo on the day of its cutting. After harvesting, crops are shredded to pieces about 0.5 in (1.3 cm) long. The material is spread in uniform layers over the floor of the silo, and closely packed. When the silo is filled or the stack built, a layer of straw or some other dry porous substance may be spread over the surface. In the silo the pressure of the material, when chaffed, excludes air from all but the top layer; in the case of the stack extra pressure is applied by weights in order to prevent excessive heating. Forage harvesters collect and chop the plant material, and deposit it in trucks or wagons. These forage harvesters can be either tractor-drawn or self-propelled. Harvesters blow the chaff into the wagon through a chute at the rear or side of the machine. 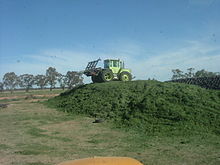 Chaff may also be emptied into a bagger, which puts the silage into a large plastic bag that is laid out on the ground. In North America, Australia, northwestern Europe, and frequently in New Zealand, silage is placed in large heaps on the ground and rolled by tractor to push out the air, then wrapped in plastic covers held down by reused tires or tire ring walls. In New Zealand and Northern Europe, the silo or "pit" is often a bunker built into the side of a bank, usually made out of concrete or old wooden railroad ties (railway sleepers). The chopped grass can then be dumped in at the top, to be drawn from the bottom in winter. This requires considerable effort to compress the stack in the silo to cure it properly. Again, the pit is covered with plastic sheet and weighed down with tire weights. In an alternative method, the cut vegetation is baled, making balage (North America) or silage bales (UK). [clarification needed] The grass or other forage is cut and partly dried until it contains 30–40% moisture (much drier than bulk silage, but too damp to be stored as dry hay). It is then made into large bales which are wrapped tightly in plastic to exclude air. The plastic may wrap the whole of each cylindrical or cuboid bale, or be wrapped around only the curved sides of a cylindrical bale, leaving the ends uncovered. In this case, the bales are placed tightly end to end on the ground, making a long continuous "sausage" of silage, often at the side of a field. The wrapping may be performed by a bale wrapper, while the baled silage is handled using a bale handler or a front-loader, either impaling the bale on a flap, or by using a special grab. The flaps do not hole the bales. 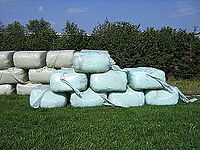 In the UK, baled silage is most often made in round bales about 4 feet by 4 feet, individually wrapped with four to six layers of "bale wrap plastic" (black, white or green 25-micrometre stretch film). The percentage of dry matter can vary from about 20% dry matter upwards. The continuous "sausage" referred to above is made with a special machine which wraps the bales as they are pushed through a rotating hoop which applies the bale wrap to the outside of the bales (round or square) in a continuous wrap. The machine places the bales on the ground after wrapping by moving forward slowly during the wrapping process. Haylage refers to high dry matter silage of around 45% to 75%. Horse haylage is usually 55% to 75% dry matter, made in small bales or larger bales. Handling of wrapped bales is most often with some type of gripper that squeezes the plastic-covered bale between two metal parts to avoid puncturing the plastic. Simple fixed versions are available for round bales which are made of two shaped pipes or tubes spaced apart to slide under the sides of the bale, but when lifted will not let it slip through. Often used on the tractor rear three-point linkage, they incorporate a trip tipping mechanism which can flip the bales over on to the flat side/end for storage on the thickest plastic layers. Silage undergoes anaerobic fermentation, which starts about 48 hours after the silo is filled, and converts sugars to acids. Fermentation is essentially complete after about two weeks. Before anaerobic fermentation starts, there is an aerobic phase in which the trapped oxygen is consumed. How closely the fodder is packed determines the nature of the resulting silage by regulating the chemical reactions that occur in the stack. When closely packed, the supply of oxygen is limited, and the attendant acid fermentation brings about decomposition of the carbohydrates present into acetic, butyric and lactic acids. This product is named sour silage. 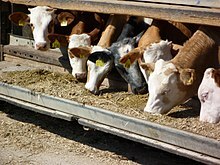 If, on the other hand, the fodder is unchaffed and loosely packed, or the silo is built gradually, oxidation proceeds more rapidly and the temperature rises; if the mass is compressed when the temperature is 140–160 °F (60–71 °C), the action ceases and sweet silage results. The nitrogenous ingredients of the fodder also change: in making sour silage as much as one-third of the albuminoids may be converted into amino and ammonium compounds; in making sweet silage a smaller proportion is changed, but they become less digestible. If the fermentation process is poorly managed, sour silage acquires an unpleasant odour due to excess production of ammonia or butyric acid (the latter is responsible for the smell of rancid butter). In the past, the fermentation was conducted by indigenous microorganisms, but, today, some bulk silage is inoculated with specific microorganisms to speed fermentation or improve the resulting silage. Silage inoculants contain one or more strains of lactic acid bacteria, and the most common is Lactobacillus plantarum. Other bacteria used include Lactobacillus buchneri, Enterococcus faecium and Pediococcus species. Ryegrasses have high sugars and respond to nitrogen fertiliser better than any other grass species. These two qualities have made ryegrass the most popular grass for silage making for the last sixty years. There are three ryegrasses in seed form and commonly used: Italian, Perennial and Hybrid. The fermentation process of silo or pit silage releases liquid. Silo effluent is corrosive. It can also contaminate water sources unless collected and treated. The high nutrient content can lead to eutrophication (hypertrophication), the growth of bacterial or algal blooms. Plastic sheeting used for sealing pit or baled silage needs proper disposal, and some areas have recycling schemes for it. Traditionally, farms have burned silage plastics; however odor and smoke concerns have led certain communities to restrict that practice. Emptying, which exposes surface, causing additional loss; rate of loss increases. Silos are potentially hazardous: deaths may occur in the process of filling and maintaining them, and several safety precautions are necessary. There is a risk of injury by machinery or from falls. When a silo is filled, fine dust particles in the air can become explosive because of their large aggregate surface area. Also, fermentation presents respiratory hazards. The ensiling process produces "silo gas" during the early stages of the fermentation process. Silage gas contains nitric oxide (NO), which will react with oxygen (O2) in the air to form nitrogen dioxide (NO2), which is toxic. Lack of oxygen inside the silo can cause asphyxiation. Molds that grow when air reaches cured silage can cause organic dust toxic syndrome. Collapsing silage from large bunker silos has caused deaths. Silage itself poses no special danger. During fermentation, the silage bacteria act on the cellulose and carbohydrates in the forage to produce volatile fatty acids (VFAs), such as acetic, propionic, lactic, and butyric acids. By lowering pH, these create a hostile environment for competing bacteria that might cause spoilage. The VFAs thus act as natural preservatives, in the same way that the lactic acid in yogurt and cheese increases the preservability of what began as milk, or vinegar (dilute acetic acid) preserves pickled vegetables. This preservative action is particularly important during winter in temperate regions, when green forage is unavailable. Several of the fermenting organisms produce vitamins: for example, lactobacillus species produce folic acid and vitamin B12. Using the same technique as the process for making sauerkraut, green fodder was preserved for animals in parts of Germany since the start of the 19th century. This gained the attention of a French agriculturist, Auguste Goffart of Sologne, near Orléans, who published a book in 1877 which described the experiences of preserving green crops in silos. Goffart's experience attracted considerable attention. The conditions of dairy farming in the USA suited the ensiling of green corn fodder, and was soon adopted by New England farmers. Francis Morris of Maryland prepared the first silage produced in America in 1876. The favourable results obtained in the U.S. led to the introduction of the system in the United Kingdom, where Thomas Kirby first introduced the process for British dairy herds. Early silos were made of stone or concrete either above or below ground, but it is recognized that air may be sufficiently excluded in a tightly pressed stack, though in this case a few inches of the fodder round the sides is generally useless owing to mildew. In the U.S. structures were typically constructed of wooden cylinders to 35 or 40 ft. in depth. In the early days of mechanized agriculture, stalks were cut and collected manually using a knife and horsedrawn wagon, and fed into a stationary machine called a "silo filler" that chopped the stalks and blew them up a narrow tube to the top of a tower silo. Silage may be used for anaerobic digestion. ^ Wood, Brian J. B. Microbiology of fermented foods Volume 1&2. Springer. p. 73. ISBN 978-0-7514-0216-2. ^ George, J. Ronald, ed. (1994). Extension publications : forage and grain crops (8th ed.). Dubuque, Iowa: Kendall/Hunt Pub. Co. ISBN 0840393415. One or more of the preceding sentences incorporates text from a publication now in the public domain: Chisholm, Hugh, ed. (1911). "Ensilage" . Encyclopædia Britannica. 9 (11th ed.). Cambridge University Press. pp. 653–654. Chisholm, Hugh, ed. (1911). "Hay" . Encyclopædia Britannica. 13 (11th ed.). Cambridge University Press. ^ "Intensive crops for high quality silage from one to five years | Cotswold Grass Seeds Direct". www.cotswoldseeds.com. Retrieved 2 December 2016. ^ Bolsen, K. K.; Ashbell, G.; Weinberg, Z. G. (1996-10-01). "Silage fermentation and silage additives - Review -". Asian-Australasian Journal of Animal Sciences. 9 (5): 483–494. doi:10.5713/ajas.1996.483. ISSN 1011-2367. ^ Heiman, Caley. The silage puzzle: Overcoming common challenges. The Progressive Dairyman. ^ Buchanan-Smith, J. G. (2 September 2010). "An investigation into palatability as a factor responsible for reduced intake of silage by sheep". Animal Production. 50 (02): 253–260. doi:10.1017/S0003356100004700. ^ Santos, F.; Wegkamp, A.; de Vos, W. M.; Smid, E. J.; Hugenholtz, J. (14 March 2008). "High-Level Folate Production in Fermented Foods by the B12 Producer Lactobacillus reuteri JCM1112". Applied and Environmental Microbiology. 74 (10): 3291–3294. doi:10.1128/AEM.02719-07. PMC 2394963. PMID 18344331. ^ Auguste Goffart, Manuel de la culture et de l'ensilage des maïs et autres fourrages verts [Manual of the cultivation and siloing of maize and other green fodders] (Paris, France: G. Masson, 1877). 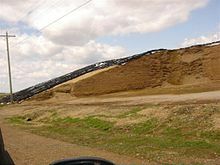 Wikimedia Commons has media related to Silage.